Peripheral Arterial Disease | Podiatry Associates, P.C. Think of your bloodstream as a highway, ferrying workers to and from their duties. The traffic flow is fantastic as long as lanes remain wide open, but problems begin to develop when the road starts to narrow. Workers can’t reach their destinations as well as they were previously able to and it becomes harder to keep up with demands on the job. In turn, work doesn’t get done as quickly as it could, and business—in this case, your body—suffers. This is the gist of peripheral arterial disease (PAD), when blood flow has difficulty supplying your legs and feet with the nutrients they need. Peripheral arterial disease is often the fault of your arteries growing harder and narrower, a condition known as atherosclerosis. Fatty deposits will build up on the inner artery walls, impeding circulation. Age and family history can play factors in developing PAD, but more controllable factors such as smoking, high cholesterol, and inactivity are frequently pinpointed as main causes. Those who live with diabetes face an especially troublesome foe in peripheral arterial disease. Not only are they more likely to suffer from the condition, but often their cases will be more severe and difficult to treat. When PAD affects the lengthy arteries of the legs, its symptoms can sometimes be seen or felt in the feet. Your one foot, along with your lower leg, may feel colder than your opposite foot. Hair may recede or grow slowly in this area as well, and it may be difficult or impossible to feel a pulse from this location. Additional symptoms include muscle pain in the legs or feet during activity, as blood flow is unable to supply the muscles quickly enough. This pain tends to go away with rest. One of the more dangerous effects of peripheral arterial disease, especially in those with diabetes, is the increased time it can take for wounds on the feet and lower legs to heal. When combined with the loss in sensation many with diabetes experience through neuropathy, a wound on the foot could go undetected and remain untreated for some time, potentially leading to a severe infection. Don’t sit at the side of the curb if you have symptoms of PAD in your lower limbs. 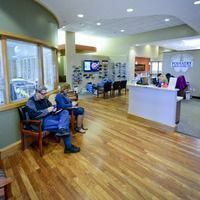 Get to Podiatry Associates, P.C. for a full evaluation. We can help you find relief and plan a lifestyle program that is safe and effective toward your specific needs. Schedule an appointment with one of our offices in Parker or Castle Pines by calling (303) 805-5156.